Grenada’s fast bowler Emmanuel Charles at his pinnacle, preparing to bowl to Vincy’s Monty Butler. 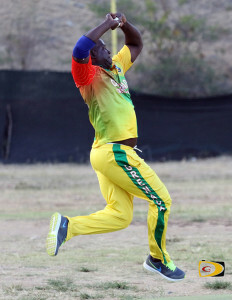 Defending champions Grenada used Man of the Match Rodney Marryshow’s 110 (19 fours and 4 sixes) in laying the foundation to flog Vincy in a domineering display on Sunday, in the BVI Cricket Association LIME Twenty 20 League. With his team electing to bat, Marryshow put on 124 with Raymond Charles (46*), from just 69 balls, for the third wicket and also added 71 from 49 balls, with David Johnson who hit 37, including 5 sixes as Grenada put up a 233 for 4 score. Vincy’s Earl Prescott was the only bowler to get a wicket for 23 runs. In their turn on the crease Vincy got into deep trouble at 49 for 6 and only reached some respectability after Monty Butler hit 59, with 7 fours and 4 sixes while McTair James had a contributing 24, to reach 143. Marryshow ripped through the Vincy line up taking 4 for 28. Kitason Francis chipped in with 2 for 41. RTW stayed at the top of Division I after comfortably turning back Under The Tree. Sylvester Mitchell stepped up with 84 at the top of the order, after Joel Williams and Austin McDowall fell early in the match, leading RTW to 252 for 7. Mitchell whose tally included 13 fours and 4 sixes along with Lando Ollivierre’s unbeaten 58, with 9 fours and 2 sixes, took the game beyond the reach Under The Tree. Only Kevin Doyley had much success with the ball as he picked up 4 for 24 and was ultimately named as Man of the Match. Under the Tree in their reply, got off to a miserable start as Colin Olivierre fell cheaply for six in the first over. Kevin Thompson, who was eventually the eight man out, scored 73 and along with Errol Prince’s 37, rebuilt the innings slowly with a 58 run partnership for the second wicket, but it was all to no avail as the innings finished on 182. The 71 run victory was sealed with an all round bowling display with five bowlers all picking up two wickets each. This weekend, Royal Knights will face Cavaliers at 10.00 a.m., followed by Island Stars against Under the Tree at 2.00 p.m.